The Before and After Bento Project came about when my fellow bentomakers and I were sharing photos of our bento from days long past. Debra (Hapabento), Megan (Bento Zen), Susan (Hawaii's Bento Box Cookbook) and I had a laugh over how much our styles have changed over the months and years. After all, we can't help but learn and grow from experience -- what tastes good, what holds up well, what looks good. Debra had the idea for us to each take our first posted bento and "remake" it, using the same ingredients and the same box, to see how it might turn out today. What an interesting project it turned out to be. So what do you think? I'll admit that my 2009 bento was probably packed in a couple of minutes max, while the re-do version bento took time for me to cut nori and carve cucumbers and carrots. I also took some liberties with the kind of rice (I used a red/brown mix). But, overall I think the extra effort was not unreasonable. Don't forget to check out my fellow bento-makers' takes on the Before and After Project. We all have differing bento backgrounds and our "first" bento comes from varying timeframes. You may be surprised! Finally, thanks to Debra, Megan and Susan for collaborating with me on a fun post! We've all learned a lot; I know I have from all of you! Love it!!! All of the same elements in today's bento but wow, what a difference in how you artfully arranged it! Beautiful! 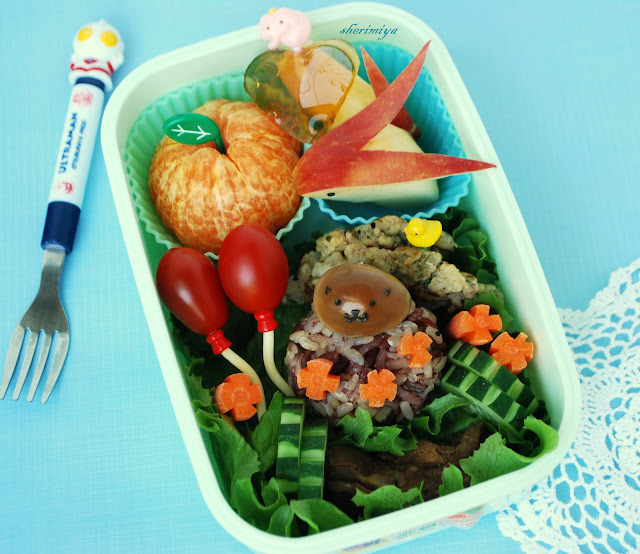 Your apple bunnies have great flair and your "after" bento is a model for pretty arrangement. What hasn't changed is your dedication to Misterman's nutrition! Good stuff! I love it!! Wow, even your 'first' bento easily outdoes mine. haha! Are those funky toothpicks making the tomatoes look like balloons? I love that! The only thing I need to worry about is how the food looks. If the rice looks 'too funky', my kid won't touch it. I love these 'vintage' bento images! Great idea Sheri! ok i found out what the problem was! i don't have a pro account so my photostream views are limited to the 200 most recent photos. and i just need to upgrade to get my originals back, i think....i guess i just have to go pro now and see ughh! I love it! It is so fun to see everyone's older bento and to see how far you've come! Wonderful post idea, this has been so fun and educational! Its beautiful to see everyone develop unique bento styles that are full of your own expressions of charm, color, and vitality! Thanks Susan! I've learned a lot about artful arrangement from you and other bento experts :) Thanks for participating in this fun joint post with me! Lyndsey, it'll be fun to watch your bento evolution over the next year. Thanks a lot! Hi Laura! Thanks a lot! Yep, you'll have to "go pro" to keep all your photos. And you're right, I couldn't bear to lose the comments and encouragement from bento friends like you who have been there so long! So glad you've "come back" to bento in recent days, missed ya! Thanks a lot Jenn! It was a lot of fun! Bentobird, you're right. Over time we all develop a bento "style" of our own, but I believe there are elements of all bentomakers present in each of our unique styles. It's such an interactive and supportive bento community, which is what I love about you and everyone here! Sheri, I love this project. How fun! Also, I like your tip about the effect of the box and content. thanks! Thanks Lil'chan! It was a lot of fun to see how our styles have changed over time. I think your project is so much fun! I have just looked up my own very first bento blog and noted down the ingredients... To be continued ;) Your bentos have definitely become brighter too! Thanks gnoegnoe! Can't wait to see your bento transformation too! You have definitely improved and so are the rest! 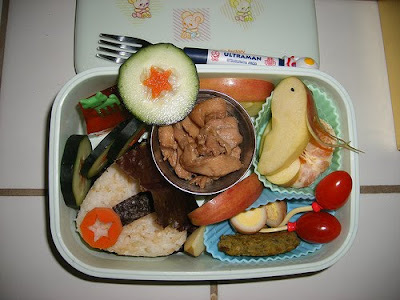 It is so much fun now that we can have so many gadgets to make our bentos more lively. Hope you can do it too!